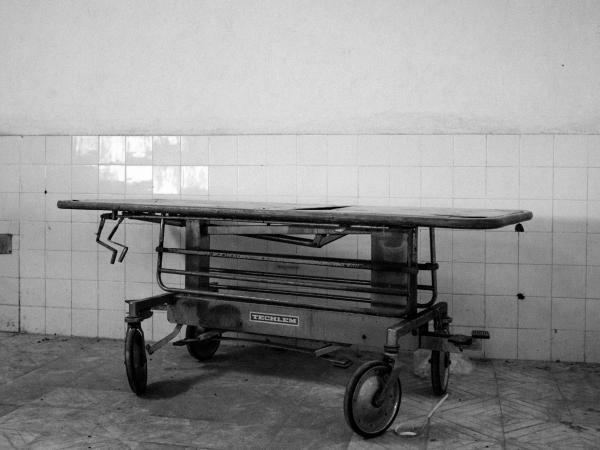 A gurney in a hospital. The study estimates that 5 million people die every year because of poor-quality health care in low- and middle-income countries. That's significantly more than the 3.6 million people in those countries who die from not having access to care. It's also five times more than annual deaths from HIV/AIDS (1 million) and three times more than diabetes (1.4 million) in the same countries — although, of course, poor health care for these conditions can also be fatal. "For a very long time in global health, we have been really mandating and supporting and pushing access to care, without really thinking about what happens when people get to the clinic," says Dr. Margaret Kruk, the co-commissioner of this study and a professor at the Harvard T. H. Chan School of Public Health. These findings come from The Lancet Global Health Commission on High Quality Health Systems, a two-year project on measuring and improving the quality of health systems around the world. The commission is made up of 30 experts — academics, policymakers, health advocates — in 18 countries. Their data comes from a range of surveys, including household surveys in 47 countries, a survey they conducted about quality of care and 81,000 assessments of care by researchers, funded by USAID, who observed health visits at clinics and hospitals in 18 countries. NPR spoke with Kruk about the study.This interview has been condensed and edited for clarity. What was perhaps the biggest finding of the report? There are 8.6 million deaths every year in low- and middle-income countries — the majority of the world, 134 countries — that could have been saved with good-quality health systems. These were deaths from treatable conditions because people didn't get good care. Of that 8.6 million, we found that 5 million were people who got care but just got poor quality care. The remaining 3.6 million were because of a lack of access, which has been the traditional focus in global health. What are examples of poor health care? On average, in health care visits, we see providers typically follow fewer than half of the recommended clinical actions. For very sick children, an average length of visit might be 6, 7 or 8 minutes with a nurse. It's too little time to properly assess that child. In a five-country sample in sub-Saharan Africa, only 50 percent of providers can accurately diagnose pneumonia or diabetes — very common conditions. The system as a whole is failing people. There are huge delays. If someone comes forward with concerns of cancer in a low-income country, there can be months of delay between that visitation and actual diagnosis — never mind treatment. It's a crisis, particularly when governments all over the world are trying to expand health insurance. If your insurance services won't save lives, what is the real value in expanding insurance and universal health coverage? Can you talk about the background of this commission? Together with my co-chair, Muhammad Pate, who was the former Minister of State for Health in Nigeria, we assembled a group of people who are academics thinking about health systems and how they function, and another group of people who are on the ground, struggling to improve health systems in the field. The whole premise of the commission is to say: How are we doing on quality globally? We were concerned the focus on access has overshadowed our understanding of what actually happens in health systems. What is the message for health-care systems? If health systems are to improve health, they have to do two things. They have to promote utilization of essential services that save lives — malaria treatment, HIV treatment and so on. But they also have to deliver on good-quality treatment, good-quality care. As you mentioned, global health has long focused on providing access to care. Now, it seems the focus is shifting to equity, to equitable access — for instance, making sure women and children receive the same quality of care as men, or that poor people receive the same level of care as their richer neighbors. It's interesting that you use the word "equity." The other major focus [of the study was on] vulnerable groups. We looked at people who are poor, who are less educated, people who have stigmatized conditions, teenagers who are pregnant. And even in a setting of relatively poor overall care, they get worse care. Even just simple treatments. For example, younger teenagers are less likely to get iron [supplements] during a prenatal care visit. Equity is critical, but I would add the word "quality." It's about access to quality services. What does quality health care look like? For us, quality is about three things. One is effective care that can improve or maintain health. The second is about earning the trust of people. The third is that systems have to adapt and adjust. That means a quick adjustment when there's an outbreak but also the ability to change over time. Fundamentally, the big shift we propose is that systems should be for and about people. We should be judging them on what they do for people — not how many doctors they train. About 1 in 3 patients consistently has a poor experience of care. Disrespectful care, extremely short visits, poor communication, long wait times. Many parents — 40 to 50 percent — leave the clinic without knowing the child's diagnosis. Is it because the provider doesn't know or is it because the provider isn't communicating? That's hard to say in a survey. But the fact remains that the parent walks out not knowing what's going on. You've mentioned child health in particular. Did your research focus on that? If so, why? The reason I mentioned children is because the strongest data we have, and the most complete, are in those areas. The Millennium Development Goals have really been about children and women, in large part, and infectious diseases. So when you look at current measurement systems and surveys and research, they are quite focused on women, children, people with HIV and so on. We wanted to speak broadly about the range of health priorities in low-income countries — which includes noncommunicable diseases, cardiovascular disease, accidents and so on. Mental health is another huge area. But we found extremely limited data. We are calling these complete blind spots right now. You mentioned a previous focus, in global health, on infectious disease. According to this report, the total number of deaths from poor-quality health care is five times higher than HIV/AIDS. These numbers are really large. We identified about 5 million deaths due to poor quality among people already using the health system. When you look at global deaths from cardiovascular disease, it's about 2.5 million. Then there's about 900,000 tuberculosis deaths. It's an epidemic, really, of poor quality. Even though access to care is still incomplete — people with depression still can't get services, people with cancer often cannot get any care in low-income countries — even with that low level of access, quality is the bigger challenge. Probably the biggest surprise for me is in this question of how we improve. That's because when we examine the evidence of very commonly used improvement strategies — checklists, refresher trainings, supervision — we were quite disappointed in the effectiveness of those strategies and the inability of these things to scale. Even if you have a result in one clinic, we have no samples where that's permeated the whole country. So we took a very different look at improvement. A lot of the improvement has been focused at the point of care — right at the moment where the provider meets the patient. But actually, given the scale of the problem, we need to move further back to a much more foundational strategy. We identified four universal actions. The first is establishing a system-wide focus on quality, because there's no accountability today. There's no system to sound an alarm, and there needs to be one. Second, you've got to redesign health systems. A lot of health systems today are organized to maximize access — a lot of small clinics spread out over a large territory. Just to give you an example, in the U.S., Australia, and other wealthy countries, very few women deliver in hospitals that don't offer C-sections — almost none. But in a five-country study we did in sub-Saharan Africa, we found that almost 1 in 3 babies born in health facilities are at very, very low-level [facilities] without C-sections, with minimally trained workers. This is an example where a service like delivery should be moved up to the hospital where surgery could be provided. Let's put that service in place and help women get to the hospital, rather than waiting for complications to develop in that remote clinic. Third, the health workforce education in many low- and middle-income countries is just really outdated. Clinicians come out very good at identifying pathologies on slides but have a harder time doing problem-solving and connecting with patients. And then the last area of improvement for us was public demand. In most service industries, it is the pressure of customers that often improves the product or service. Yet in health care, we ignore patients as consumers. Many people anticipate low quality and have low expectations. But people do want good care. So how do those people get better services? We really do need to gather together and think about what we can do to support low-income countries in the transformation we're calling for. One thing is introducing new measures and new knowledge that will help one country learn from another. We have to stop flooding the countries with quick fixes and shiny solutions. High-quality health systems are fundamentally a political issue. It's a critical moment for leaders to see what people are looking for from the health system.